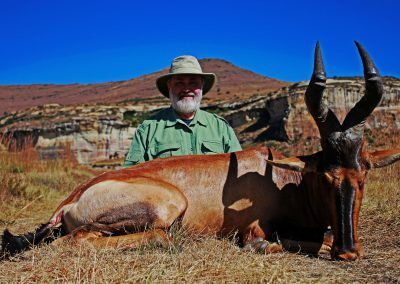 Trophy hunting black rhinos in South Africa with Mkulu African Hunting Safaris. Trophy hunting black rhinos in South Africa is to add to the hunters’ coveted Big 5 collection. Poaching and lack of suitable, safe habitat of rhinos is putting a strain on black rhino hunting prices and populations. Rhino owners are forever having to apply new methods of protecting their assets. This unfortunately costs money and the end-user pays for it. 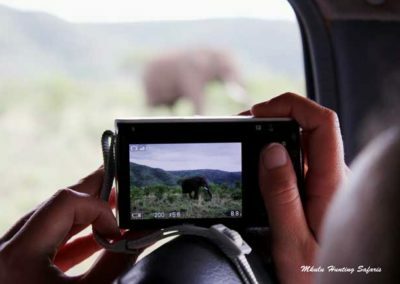 At Mkulu African Hunting Safaris we have tried to contain our hunting expenses so we can pass any savings on to you as a hunter. A very limited number of tags are issued annually for trophy hunting black rhinos in the whole of southern Africa. To legally hunt a black rhino Mkulu Safaris require a pre-issued black rhino hunting tag even before we advertise availability of a black rhino hunt. Interested in hunting a white rhino? There is a very strict process in the application for a black rhino hunting tag from which we will not deviate. Export of trophy hunted rhinos are restricted to certain countries. Application for trophy hunting black rhino tags can take several months. Therefore, if you decide to trophy hunt a black rhino, we will assist in the application process for the tag. Some of the information required in the application will be to determine if you are a true sport hunter. In order to prove you are indeed a sport hunter we need to have proof the hunter has hunted other members of the Big 5 prior to applying for a black rhino tag. The cost of trophy hunting black rhinos in South Africa is determined according to the length of the front horn and availability of black rhino hunting tags. 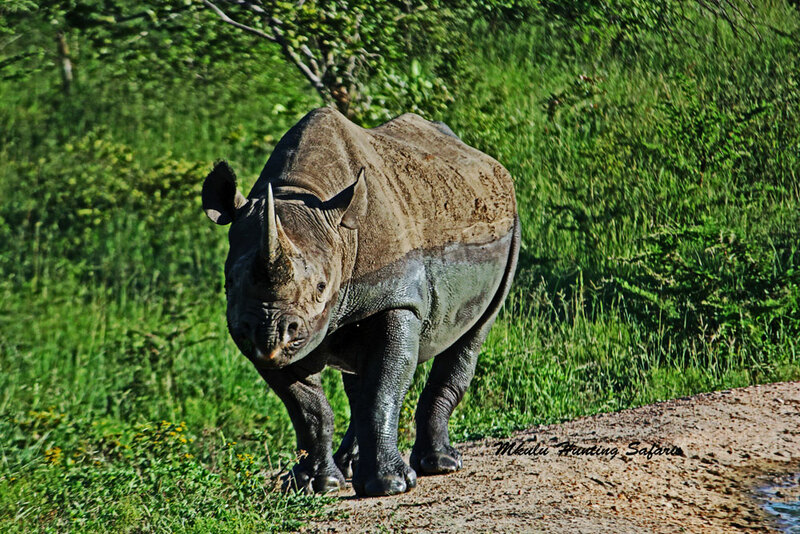 Our black rhino hunting prices in South Africa are set according to the size of the black rhino you wish to hunt. 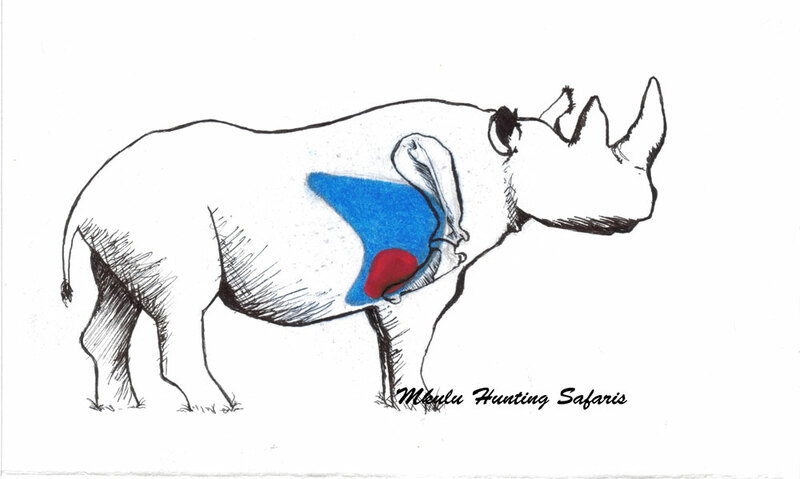 In the case of hunting black rhinos, we usually take what we can get and the final decision is up to the hunter. Please contact us if you are interested in trophy hunting a black rhino. Total anonymity is guaranteed. 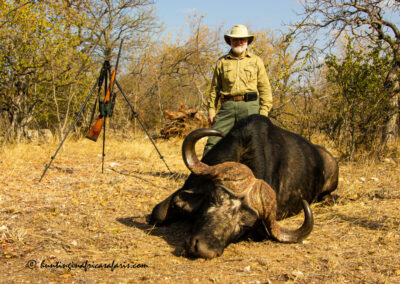 Mkulu African Hunting Safaris preferred ammunition manufacturer is Hornady and Federal Premium in just about any weight. You can use 500 grain solid projectiles with confidence. 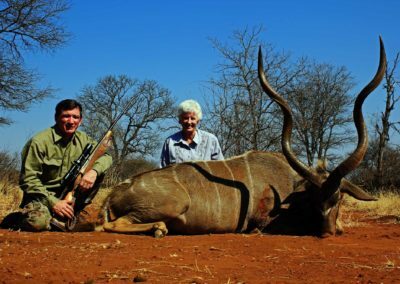 A good 1,5 – 6 X gun scope should be sufficient for trophy hunting black rhinos in South Africa. This is due to a rather short expected average shooting distance. For the purists who hunt with double rifles: you are welcome to use open sights. The average expected shooting distance when hunting black rhino in South Africa is 10 to 30 yards depending on how dense the terrain is you are hunting in. The shot should be placed in line with the front leg, right on the roll of the skin formed on the shoulder or the animal. These are thick-skinned animals making it difficult for the projectile to penetrate to the vital organs. It is therefore critical to use a large caliber rifle with enough penetration capability to reach the vitals on a quartering-to shot. It is critical to use a large caliber rifle with enough penetration capability to reach the vitals in case of a quartering away shot: should the projectile need to penetrate through the stomach to the vitals it will need additional energy to pass through the stomach content. Apply patience and wait for a full broadside shot. 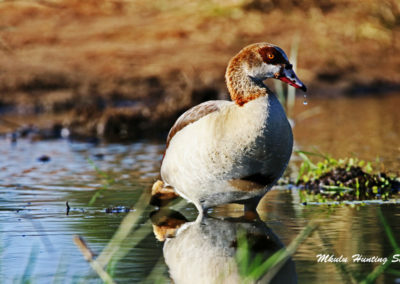 A facing to shot should only be attempted when the animal is browsing and when the hunter is close enough to ensure not hitting the bottom jaw. Once again, the caliber choice for trophy hunting black rhinos is critical. 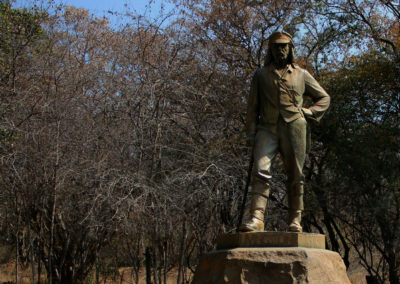 To walk-and-stalk when trophy hunting black rhinos is the traditional way of going about it. Solitary bulls can be stalked with more ease with a wind that consistently blows in your favor. 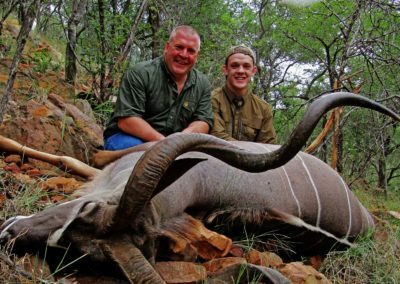 Archery hunting black rhinos, white rhino and elephants are illegal in South Africa. Tracking black rhino cows with embedded calf tracks inside the cow tracks, must be avoided. Extreme caution should be applied when on the final approach. Any sudden wind shifts will attract the attention of a weary black rhino and result in a no-hunt situation. 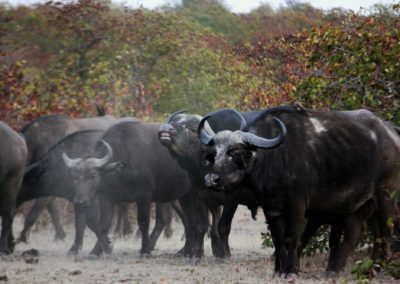 Bear in mind that slight movements and sounds can, and will, attract attention of the unwanted kind from black rhinos. 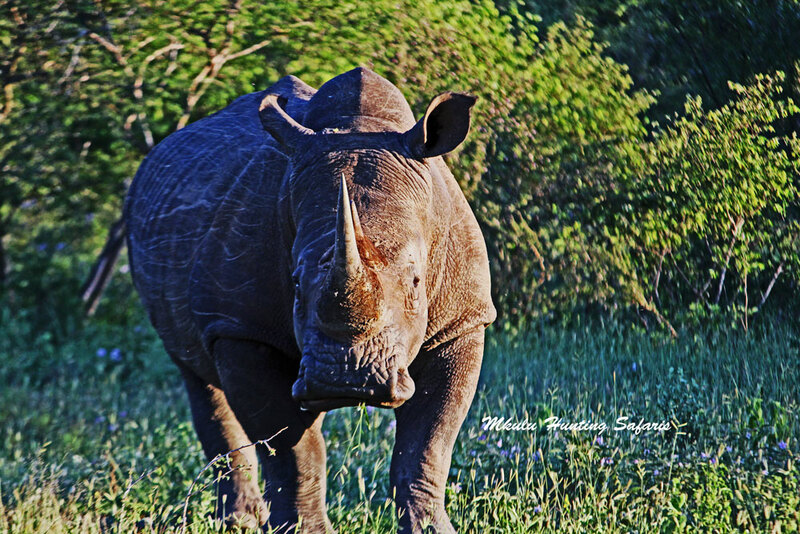 Due to the preferred dense habitat of black rhinos, they are better to hunt during the dry time of year. 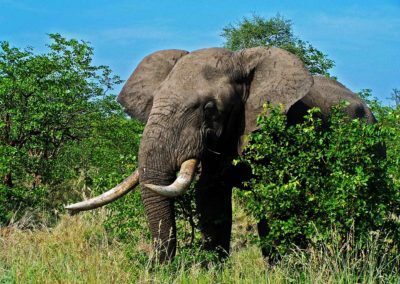 These large animals (pachyderms: thick skinned animals) have awful eyesight but brilliant hearing and smelling abilities. 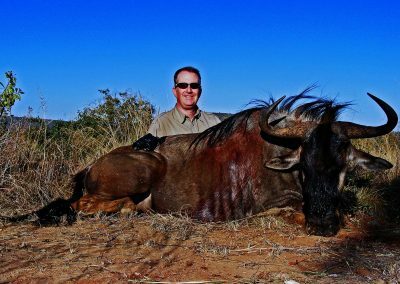 The best time of year for trophy hunting black rhinos in South Africa is from May to October.